Well done AFL NSW/ACT and GWS Giants. 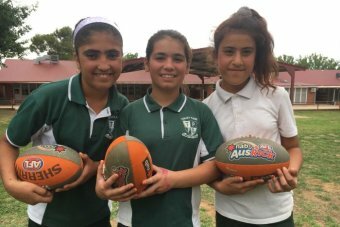 Learning how to kick a footy and take a mark are skills many Australian kids learn growing up, but for those who've come across the seas, it can be a foreign concept. 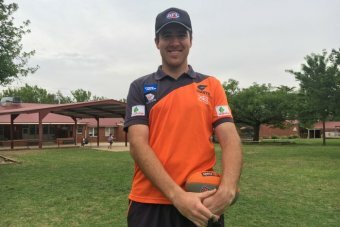 Now a program in the New South Wales Riverina is helping make life easier for young refugees by teaching them how to play AFL. Tahira Roshan, aged 12, from Afghanistan, said she had never played the game. 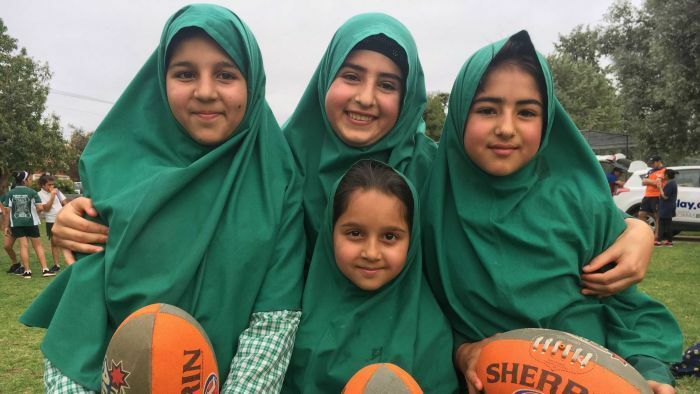 "I think AFL is a good sport for us, we can move our bodies and we can learn how to play — it's very good for us," she said. "I think AFL is the best sport I've ever had." Benjamin Walsh from AFL Riverina said the program has been a huge success. "It just allows them to fit in that little bit more, playing a sport that most of their peers would play, as well as helping them join in and become part of the community that little bit easier," he said. It has also been rewarding for him as a coach. "I really enjoyed teaching the kids the basics," he said. "They probably listen and take note that little bit more than a lot of other kids so it's been great. Ismail Darwish's children are taking part in the program. "Everyday when they didn't play football they asked me 'when are we going to play Australian football?" he said. "Now I'm waiting to pick them up, but they don't want to come home because they're very happy." The Wagga Wagga Multicultural Council organised the program. Community development officer Thom Paton said it has been a hit with the students. 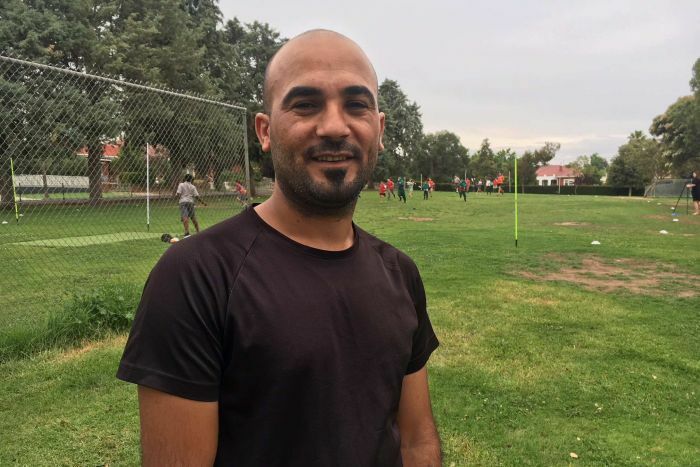 "Already after a couple of sessions a few of the girls want to pick it up and register with a few local teams," he said. "They've picked up the skills quickly and are very competitive." You think they need the nrl counters for their crowd or participation rate numbers to monitor numbers pussytwat? The afl puff pieces are always good for a laugh . Hmm, a paid advertisement on the ABC? Yeah, that makes a whole lot of sense. It's hilarious the afl puff pieces. So again... how is this story a paid advertisement as you suggested previously? Since when does the ABC accept paid advertising? Go on... please explain!!! The AflBC love promoting afl feelgood stories . Oh & has an Afghan made it to the Afl yet . Lol way way behind RL in accepting other cultures . We are way way ahead in multiculturalism . Come on Beatup, this is clearly a beatup lol initiated by the propaganda arm of the Australian Fumbling League. They ring up Riverina ABC on a slow news day and say, 'hey fellas want a feel good fluff piece? We've got a beauty'. It's fumbleball propaganda 101 pal. In fact all codes do it. It's just that the fumbling folk actually nod in unison, pat each other on the back and bow to the great god fumble lololololoolol. Dills!! Below is a couple of RL stories about Afghani and African kids. At least these kids actually play the game and haven't been rounded up for a kick to kick photo opportunity with a few freebies thrown in. FMD the delusion these fuckwits are under! Ok.......so you're the original llloller. Are you ok pal?????? Now to the point: Did you read my post?? Did you understand it?? I clearly stated 'all codes do it'. Just to clarify: I meant every code promotes itself. In this case RL used foreign born folk actually playing full blown Rugby League in proper full season competitions to promote itself. Fumbleball went to a school & had a few low level kick to kick drills with some foreign kids to promote itself. And of course they had a camera and reporter in tow. Remember the Lawson report? Reality V perception it was called. In the cases cited RL promotes itself with registered players that play the game - that's reality. The AFL has a photo op with casual auskickers to promote itself. As Lawson stated, they are creating a perception that masks the reality. Get it?? No!!! Didn't think so lololololol!!!!!!!!!!!!!! Do lots of Australians feel ashamed a such a crap sport is called Aussie Rules? If they came up with a sport called English Rules and you could drop the ball constantly and get a point for missing. Is Gaelic Football a 'fitter' code than Aussie Rules? Having played both, and if we're talking aerobic fitness, I'd have to say yes, for sure. New brain to table 7 - stat!! Aussie rules a very British game! Myths and milestones in the history of Australian sport! Well to be honest eskimos would drop the fish less & fall over less than a game of AFL. So that is an unfair comparison to eskimos. Does Raiderdave know more about Aussie Rules footy than cos? Oi you, nsw, say sorry.